AMMAN- HE Dr. Talal Abu-Ghazaleh patronized the “Arab Unity” concert that addressed the Palestinian conflict, Jerusalem, and the martyrs. The concert was organized by Talal Abu-Ghazaleh Business & Culture Radio, at Al Hussein Cultural Center - Ras Al Ein. The Opera words were written by Ms. Dahook Mamoun Al Dawood, and performed by Aydah Americani. The attendants included many highly regarded people including diplomatic representatives, Jordanian and Arabic media, and with a distinguished participation of the Lebanese TV host, Tony Khalifah. In his speech, Dr. Abu-Ghazaleh emphasized the importance of supporting committed art, seeing as it is the basis for the development and advancement of nations, culturally and humanly, stressing the importance of theater and music in the dissemination and popularization of peoples issues, particularly the global humanitarian issue, the Palestinian conflict. Dr. Abu-Ghazaleh pointed to the importance of Arab peoples' awareness of the great values the region holds in terms of human concepts and principles. "In this geographical region, we share cultural, intellectual, knowledge and religious diversity and speak one language. Opponents have been trying for so long to destroy and rescind this language, but their hopeless attempts have all failed due to the firmness of its roots”. He also stressed the positivity of the different viewpoints between the Arab siblings, “Differences do not mean disagreement. It is an added value that contributes to the development of our societies and creates a spirit of competition and solidarity to rise again”. His Excellency reminded the attendants of the glories of the diverse Arab civilization that managed to govern the world for five centuries. "History and geography confirm that we will win the next round to come back, unite and lead the cultural race in the world scene," he said. The TV host, Tony Khalifah, who came to the Jordanian capital, Amman, especially to participate in this event and be present among his fans gave a speech full of hope and pain towards what the Arab world is witnessing from wars, division and colonization. Khalifah has emphasized that there will be light at the end of every tunnel of darkness, “The Arab countries will return and rise again.” he said. “How come we cannot keep the light of hope and challenge to make a beautiful reality, while we are holding this ceremony under the patronage of Dr. Talal Abu-Ghazaleh, the Arab world model in success, positivity, challenge and will? Resistance can be achieved by science and work”. The Arab Unity Opera that talked about the issue of all of us, the Palestinian conflict, Jerusalem and the martyrs, touched the hearts of the attendants, especially with the voice of Aida Americani, accompanied by an orchestra of great musicians, and a great interaction from the audience. The music had an optimistic spirit supporting national and Arabian standards in our souls. 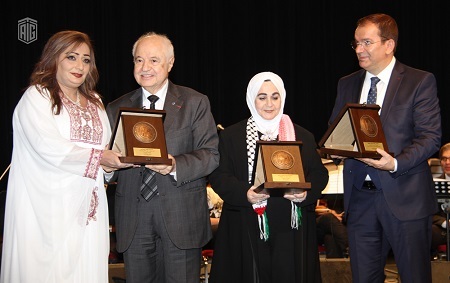 At the end of the ceremony, Dr. Abu-Ghazaleh honored Mr. Tony Khalifah, the writer Al Daoud and the warm voice "Aida Amerikani" and handed them the commemorative shields, thanking all those who contributed to the success of the opera. The concert was broadcast live by Talal Abu-Ghazaleh Business & Culture Radio.